Well, I'm still not quite sure about submitting this. There are still some errors, since this was my first CG. Made this a long while ago (one month ago) I think. Maybe I'll update it again someday. Still haven't got much support from there, that's why I'm not quite sure. Please +fav IF you like it. I love the background and the falling sakuras. Amazing work! The coloring was done really well and I love all the details. I really like how the clouds are setted up. Your coloring style is really pretty too. A really pretty drawing! Wow, great job! The characters are very well drawn and colored, and the night scenery is really cool too. Good job on the CG and keep up the good work! you don't like this??? but it's really pretty!!!! i love the bg...very neat and real...the whole thing looks sureal!!! great work! absolutely incredible. the girls kimono looks incredible. the blue sky looks incredilbe. the guys shirt has its own sense of elegance. 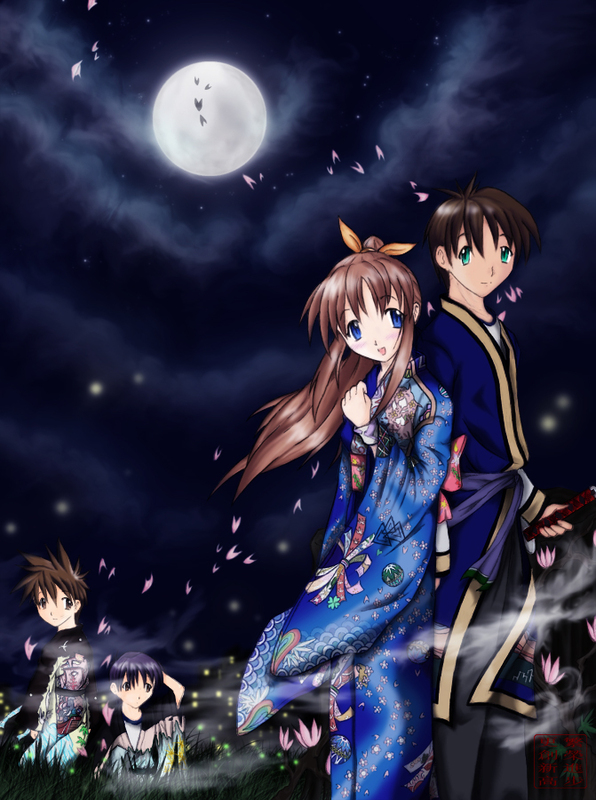 the moon bg and the little sakura petals..
o wow! i love the background! XD its so pretty! :D i like it a lot! Excellent draw, u have done it very well, the effects are also great. Keep up. Take care. Characters are so charismatic, so nice! I really liked your style, you have a gret art! congrats Verbeek! Simply beautiful! It looks 10x better in color! Of course I still like the original in pencil. Ever: Wow...the colour is like....very well done!!!! Ever:Gosh! How long did it take to make it? Shadows: How were you able to? Can you help us?!?!?! please!!!! Ever In The Shadows: Well, see ya round!!! !